Located just off the coast of Biscay, in the Basque region of Spain, is the exceptional islet of Gaztelugatxe crowned by the hermitage of Gaztelugatxeko Doniene. The island is beautiful, the setting inspiring but what makes this place so special is the incredible walkway and stairs that take visitors from the mainland to the hermitage. Made entirely out of hand-laid stones, the narrow pathway has over 230 steps and, because of the steep climb, has several hairpin bends and a long stone causeway over the sea. The hermitage church of Gaztelugatxeko Doniene dates from the tenth century and is dedicated to John the Baptist. It is believed to have been burned down and been rebuilt several times. 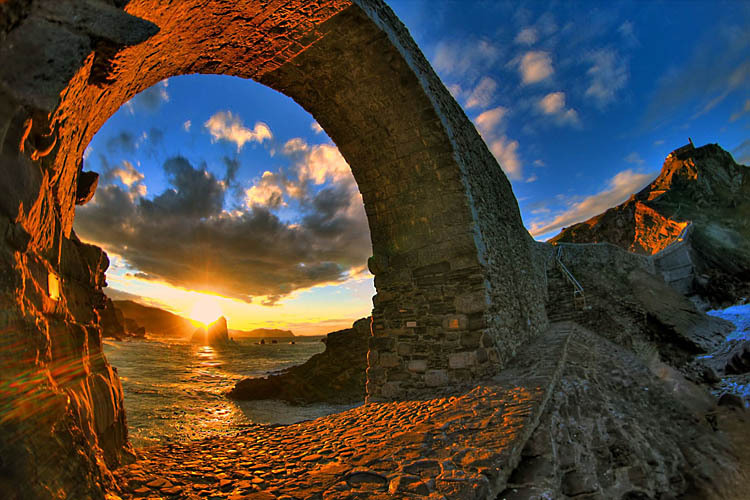 Sunset through the arches of the Gaztelugatxe causeway. 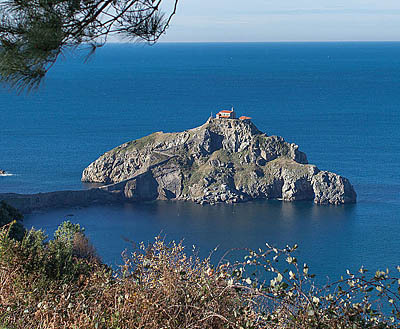 Researchers estimate that the first hermitage that existed on the islet of Gaztelugatxe was founded in the 9th century. During the 12th century it was used as a convent before becoming a monastery. Sometime in the 14th century it was abandoned by the resident friars who took with them anything of value. Local legend tells that the islet was also once used by the Knights Templar and that they were responsible for building one of temples that was later destroyed by fire. It was eventually reoccupied but in 1593, during the Anglo-Spanish War it was attacked and looted by the English under the command of Sir Francis Drake. It was attacked again in 1594 by the Huguenots of La Rochelle who killed the caretaker and robbed the building. It was attacked again during the 18th century as part of the War of the Spanish Succession. An accidental fire destroyed the building in 1978 which was rebuilt over the next two years. The current building dates to 1980. People who make the climb to the church are advised to ring the bell three times and make a wish. There is a small shelter adjacent to the hermitage where people can take refuge from the wind and picnic surrounded by the sea views. 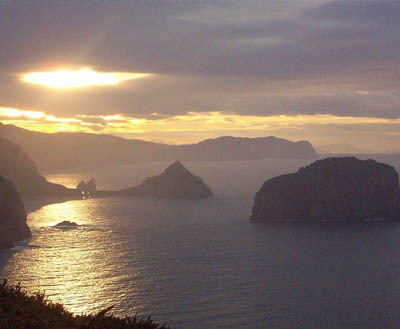 The incredibly successful TV series – Game of Thrones – is believed to be using the site as film location for season seven. 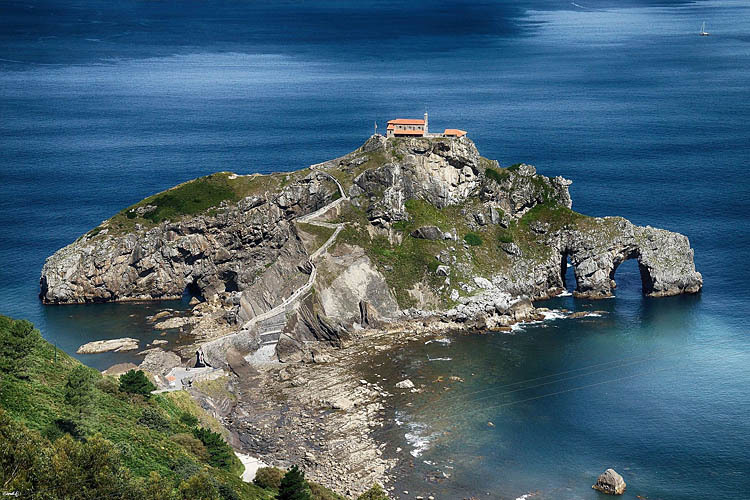 Gaztelugatxe from above showing the caves and sea arches for which the region is famous. Next ArticleIs a Zombie Apocalypse Really Possible?